Before logging a single minute in the NBA, before the fate of his future is determined in June’s NBA draft — even before the draft lottery, when we found out the order in which teams will pick — Lonzo Ball dropped his first signature shoe. On May 4, his family’s Big Baller Brand unveiled the top-three NBA prospect’s “flagship model” ZO2 Prime sneakers with a jaw-dropping $495 price tag. BBB also dropped a memorabilia edition pair of the shoes with Ball’s signature for $995, as well as a set of flip-flops, the ZO2 Signature Slides, for $220. On May 8, LaVar Ball went on Fox Sports 1’s Undisputed, declaring that the brand had sold “at least” 495 pairs of the $495 shoes. And when show co-host Shannon Sharpe proclaimed that the GOAT (greatest of all time) Michael Jordan couldn’t have even sold his first shoe for $100 as a rookie, LaVar Ball quickly clapped back, “Because he ain’t Lonzo Ball. That’s why.” Three days after LaVar Ball’s Undisputed appearance, the Los Angeles Times reported that “500 pairs of the three models of shoes and sandals were ordered in the first week, according to inventory data in the source code for the company’s website.” As for the $495 ZO2 Primes? BBB had received only 356 orders in a week, also according to the Los Angeles Times. Let that price sink in again. Four-hundred and ninety-five dollars. In Nike’s 50-plus-year history, the company has never released a basketball shoe at retail for more than $315, and the most expensive shoes Jordan Brand has dropped this year — the Air Jordan 5 “Take Flight” and Air Max 1 x Air Jordan III Atmos Pack (two pairs) — retailed at $400. The first signature sneakers of these select eight NBA superstars, past and present, each dropped — inflation-adjusted — for less than Lonzo Ball’s ZO2 Primes. Throughout their respective careers, this group combines for 20 NBA titles, 15 league MVP awards and 87 All-Star appearances. Regardless, LaVar Ball would still probably say that these players aren’t big ballers like Lonzo Ball. 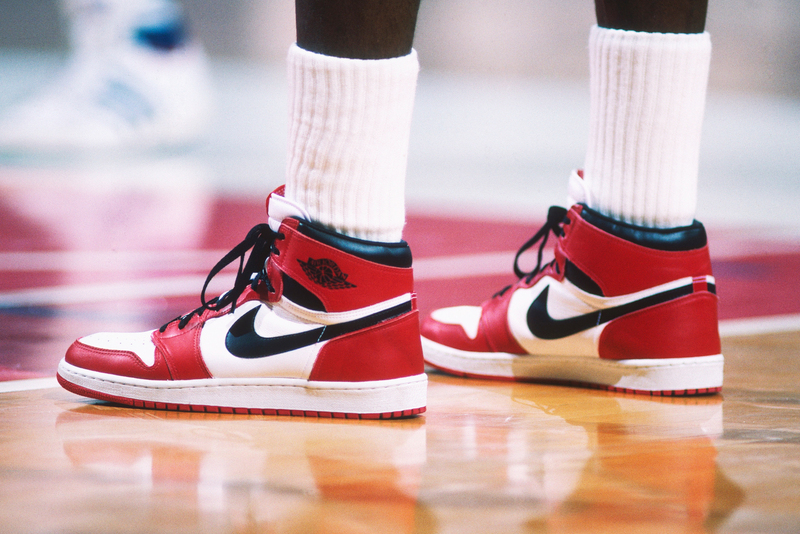 The “Air Jordan” Nike shoes worn by the Chicago Bulls’ Michael Jordan during a game against the Washington Bullets at Capital Centre circa 1985 in Washington, D.C. If only we could hop in a DeLorean and go back to 1985 (the year Back to the Future was released) to cop a pair of Air Jordan 1s — the first signature shoe of the sneaker god himself, Jordan — for just $65. In September 2016, the red-and-black “Bred” 1s resurfaced as a retro release for the sixth time since ’85 for $160. That means for $5 more than one pair of ZO2 Primes, you could get, at retail, three pairs of Air Jordan 1s AND the entire Back to the Future trilogy on Blu-ray. Shaquille O’Neal poses with Shaq-labeled items and basketballs in a studio. No one took the price of the ZO2 Primes, and LaVar Ball’s clapback justification, to heart more than Shaquille O’Neal. The same year that he was the No. 1 pick in the NBA draft, the big man endorsed his first shoe. 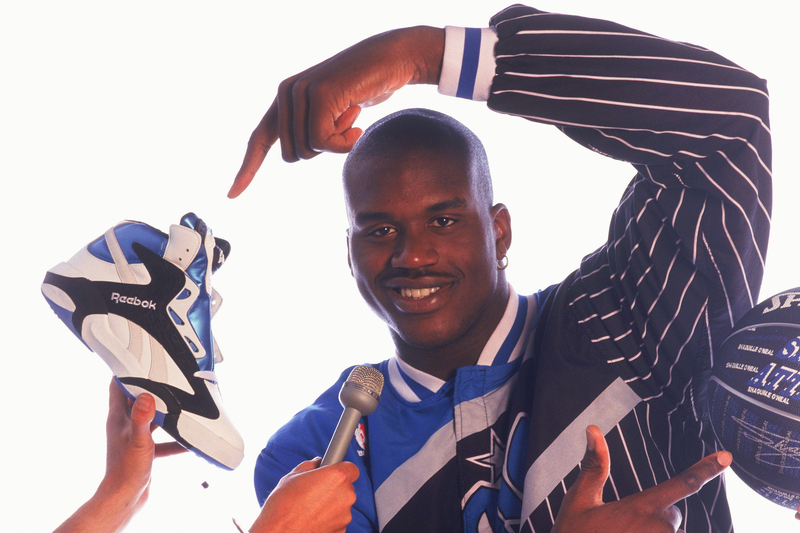 In 1992, the Shaq Attaq retailed at $130, which was pretty pricey. Then, years later, O’Neal’s outlook on the sneaker market was completely changed by one tearful mother who asked him, “Why don’t one of you son of a b—— make an affordable sneaker?” O’Neal recalled of the moment in a 2008 Forbes story. He began releasing affordable shoes under his own Shaq brand in 1996 and five years later under his Dunkman brand. Over the years, his shoes have sold at Payless and Wal-Mart for as low as $12. So O’Neal has no sympathy for LaVar Ball. 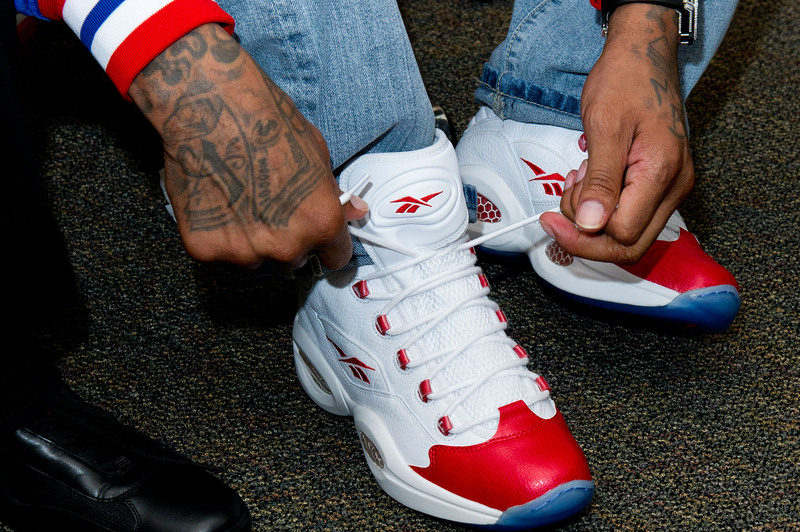 Allen Iverson puts on a Reebok Question sneaker at the Wells Fargo Center on May 23, 2012, in Philadelphia. Jordan is to Nike what Allen Iverson is to Reebok — each brand was along for the ride as both players went from top-three draft picks to Hall of Famers. Not long after Iverson was selected No. 1 overall by the Philadelphia 76ers in the 1996 NBA draft, Reebok inked him to a 10-year, $50 million deal. Five and a half years later, Iverson signed a lifetime contract with the company. The relationship began with the Reebok Question, released during his rookie season. You can still find a pair of Questions in various colorways. Right now, Finish Line carries them for as low as $68.98. Kobe Bryant has been the face (or foot) of some of Nike’s dopest shoes for almost a decade and a half, although his sneaker career actually began with Adidas. The company signed the 13th overall pick in the ’96 draft straight out of high school, and Bryant started his playing days in the Adidas Elevation EQTs, in which he won the 1997 Slam Dunk Contest (see above). He didn’t get the signature treatment until 1997’s adidas KB8, which Complex ranked in 2012 as one of the top 10 shoes in NBA history. Like the Reebok Questions, the Crazy 8s are still for sale today online, for just $10 more than what they sold for 20 years ago. 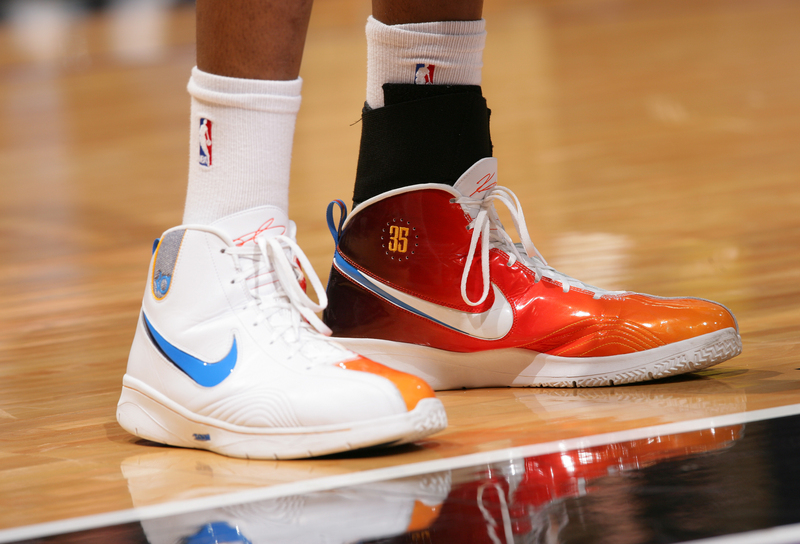 Kevin Durant of the Oklahoma City Thunder wears some flashy shoes while taking on the Sacramento Kings on Feb. 1, 2009, at ARCO Arena in Sacramento, California. Kevin Durant kicked off his NBA career with a commitment to producing affordable signature sneakers. At a retail price of $88, his first shoe, the Nike Zoom KD 1, released in February 2009, nearly two years after he was the No. 2 overall pick in the 2007 NBA draft. “I put them at $88, and a lot of people have been buying them …,” Durant told The Oklahoman in 2011. Oddly enough, the KD 2s were $3 cheaper at $85. But as Durant has emerged over the years into a top-five player in the league, his shoes have become more expensive. “As humbly as I can say it, I’m not an $88 player. I’m an elite player in the league,” Durant told Nice Kicks last summer. The $180 KD 8s are his steepest sneakers to date, but since they dropped in 2015, Durant’s latest two editions, the KD 9s and recently announced KD 10s, went down in price at $150 a pair. 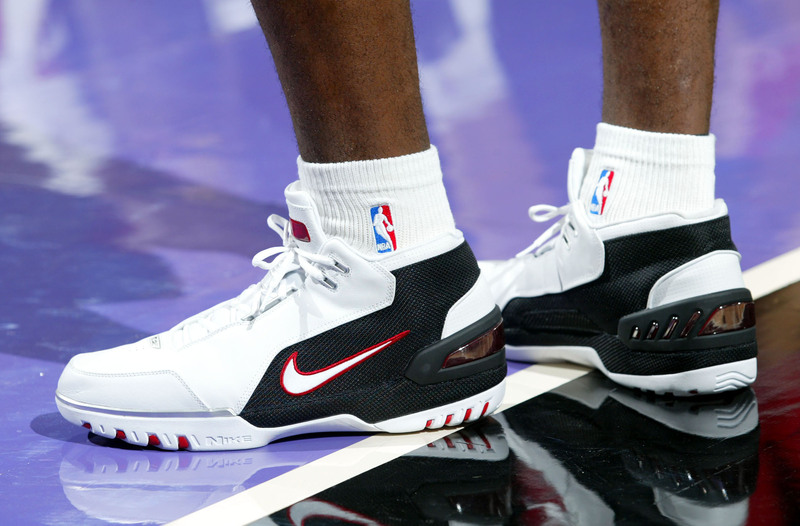 A detail of Lebron James’ shoes before his first NBA game, Oct. 29, 2003, against the Kings at Arco Arena in Sacramento. The most expensive basketball sneaker Nike has ever released was a part of LeBron James’ signature line. At a price of $315, the Nike LeBron X Plus, equipped with motion-sensor technology, released in 2012, when James became the only other player in history besides Jordan to win the NBA MVP award, an NBA championship, NBA Finals MVP and an Olympic gold medal in the same year. That meant, as hefty as the price was, the red-white-blue-and-gold LeBron Xs were essentially a collectors’ item. The same was the case for James’ first Nike sneaker, the Nike Air Zoom Generation, until the shoes were retroed in 2017 for $170 a pair at retail. If Nike and LeBron James, the future GOAT, can bring back a pair of shoes after nearly 15 years for less than $200, Big Baller Brand and Lonzo Ball can at least charge less than $200 … for flip-flops. Like, c’mon, son. 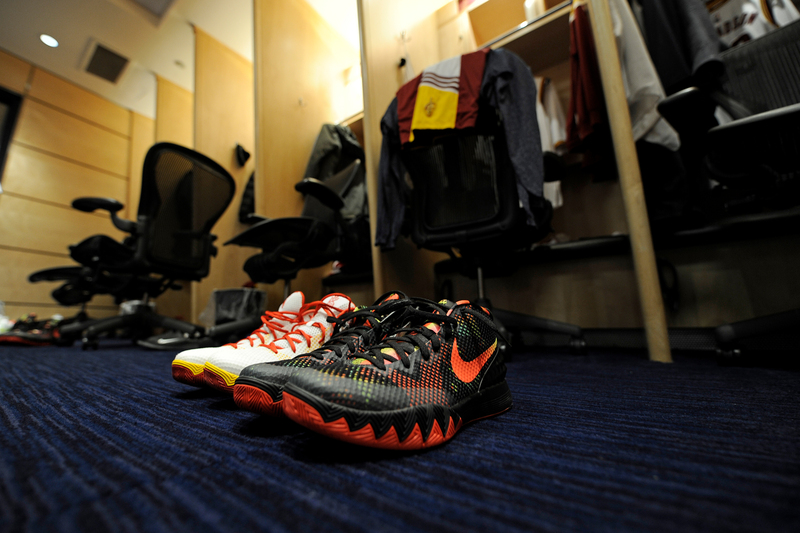 The shoes of Cleveland Cavaliers point guard Kyrie Irving before the game against the Brooklyn Nets on Dec. 19, 2014, at Quicken Loans Arena in Cleveland. Kyrie Irving’s first signature shoe, the Nike Kyrie 1: $110. The Kyrie 2 : $125. The Kyrie 3: $120. Realizing that you could buy all three pairs of the four-time All-Star and NBA champion’s sneakers for less than one pair of Lonzo Ball’s ZO2 Primes: priceless. 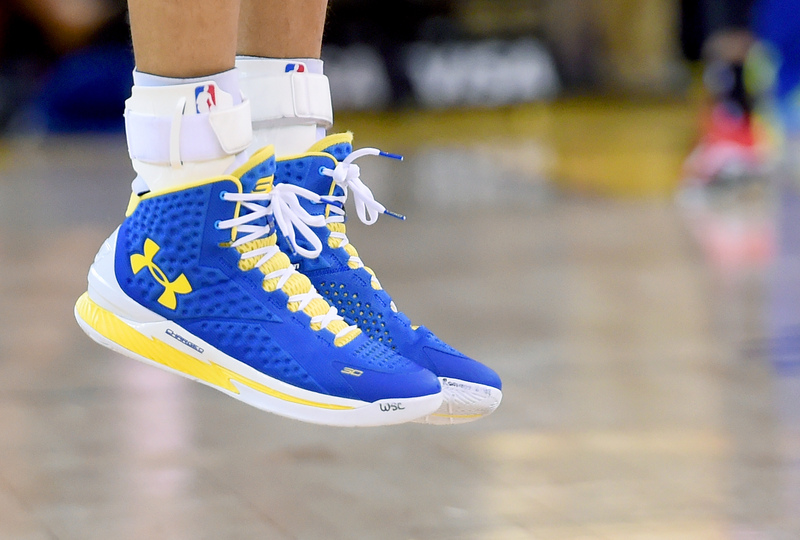 A detailed view of the Under Armour basketball shoes worn by Stephen Curry of the Golden State Warriors against the Miami Heat at ORACLE Arena on Jan. 14, 2015, in Oakland, California. Stephen Curry — an NBA champion, two-time league MVP and the greatest shooter basketball has ever seen — didn’t get his first signature shoe until six years into his career. By then, in January 2015 (before he won MVP and his first title), the Under Armour Curry One debuted at a reasonable $120. After years as a Nike-endorsed athlete (though the company never gave him a signature shoe and dropped the ball big-time on signing him long term), Curry took a chance with Under Armour and has since put the company on the map in the domain of basketball shoes and apparel. Curry, on the court and through sneakers, is a prime representation of the notion that good things come to those who wait. Don’t tell the Balls that, though.